HTC One Max is a high-end Android Smartphone manufactured by HTC. One of the most popular features of this device is that it is incorporated with finger recognition feature. With this feature, users can unlock their Smartphone by swiping vertically on the fingerprint scanner. The system is designed to recognize up to three fingers. Though packed with high-speed processors and exceptional hardware specifications, this device is also not free from faults. 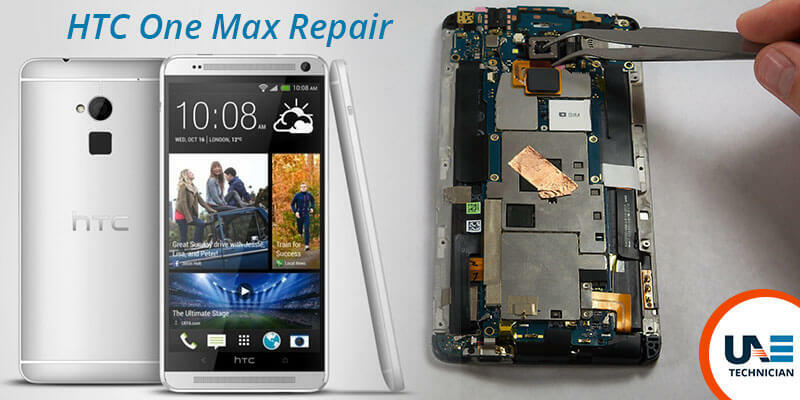 If you encounter any problem while using this device, come in contact with us for authentic HTC One Max repair. HTC One Max is not turning on- This is a very common issue which can arise due to a number of reasons. If the charge in the battery of your Smartphone is too slow, if it is probably dead or not connected properly, then there is a high chance that your device will not turn on. Fingerprint sensor issue- Due to some problem with the touch ID sensor or because of the multiple prints of different fingers might block the fingerprint sensor for some time. Rear camera of the device is not working- If some alterations have been made in the camera settings or in the status of the device or there is a problem in the rear camera’s lens, then your rear camera might stop working. Wifi connectivity issue- Due to incompatibility issue in the frequencies of the Wifi receiver and the router, this issue occurs. Bluetooth connectivity issue- While pairing your Bluetooth device with the Smartphone, if your device fails to recognize the HTC One Max, you will not be able to connect. It can be due to mismatching of the protocols of the device and the Bluetooth. Is your HTC One Max not working? Are you looking for any reputable HTC One Max repair services? Get in touch with us today. Don’t wait for the right time. We have earned a reputation for handling these sort at the earliest. Our experts at UAE Technician offer quick and professional repairs for your HTC device. We not only repair the damaged parts of the product but also replace the faulty components. Our services provide the best HTC One Max Repair in Dubai. You can reach us to get the most accurate solutions for all the problems which you often encounter with your HTC One Max. Can call on our helpline number: 042053349 to get better solutions for your Smartphone issues. You can even send us emails mentioning your problems. We are very responsive to our customer’s calls and messages. Feel free to talk to our professionals through Live Chat support. Any feedback regarding our services is more than welcome. Connect with us today! We also provide HTC One M7 repair service.